Is a lemur in spite of its rodent teeth, its large owl eyes, its big hypersensitive bat ears and its thick tail. It belongs to a monotypic family : the Daubentinidae family. So the Aye Aye is distinct from all other primates. It has a blackish brown coat. Nowadays there is just few individuals of this species in the world. The Aye Aye lemur lives in the primary evergreen rainforests and in the worn out deciduous dry forests of Madagascar. The most indicated spot for its observation is NORTHERN MANANARA ( or MANGABE ISLAND ). The Aye Aye lemur is strictly nocturnal and it is a solitary animal. It builds its nest ( made of leaves and branches ) in a crotch of the large trees ( approximately 20 meters from the ground ). Gives birth to only one baby per range with a 158 gestation days. The mother breeds its little baby with its breasts situated between its posterior legs. 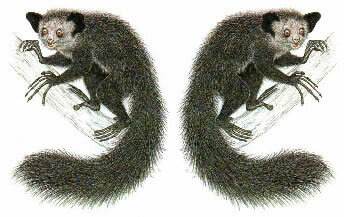 If you see two Aye Aye lemurs in a nest, it will be the mother & its baby. Except for the Aye-aye Lemur and the Lac Alaotra Gentle Lemur, lemurs are seasonal breeders with very short mating and birth seasons influenced by the highly seasonal availability of resources in their environment. Has a short and piercing cry when it is afraid. It has 18 teeth including 14 molar mashers, 2 upper incisors and 2 lower incisors ; all the 4 incisors are very long and cutting. They help the Aye Aye to shear the barks, to pierce the coconuts. Has 5 very long skeletal fingers which finished by claws, the 3rd thinger can rotates in all directions. It uses this finger to excavate cavities and to catch larvaes from holes, insects or the pulp of fruits ( especially coconuts, cane sugar, mangos and litchis ). It uses its large ears to locating insect larvae in dead wood. It is virtually certain that the Aye Aye species ( unique in the world ) was driven to extinction by human action. ( where you can see the Aye Aye lemur ) is a spectacular sanctuary of life : 230 000 hectares of primary forest. Masoala National Park : a preserving natural heritage and nature's aquariums with its three marine protected areas. The park has a large endemic and unique species of flora and fauna such as lemurs, geckos, frogs and birds. Whether you are a naturalist in search of pristine rainforest, a hiker thirsty for adventure, or a vacationer in search of paradise, a jewel of emerald forest surrounded by an azure ocean awaits you. Come and enjoy the beauty of Masoala. Various trails provide unforgettable trekking ( the adventurous can traverse the peninsula from Maroantsetra to Cap-Est ; or from Maroantsetra to Antalaha ; or to explore the East coast : the region of Ambanizana, Ambodiforaha, Lohatrozona, Tampolo and Antalaviana ). To visit another world. 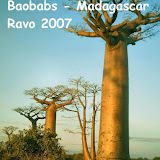 Madagascar and its nature, its people, its Parks and Reserves. Madagascar, a real natural sanctuary. With our experiences since ... 1993, we will give you excellent advice. We can organise your trip and to guide you to make your trip pleasing and unforgetable. Madagascar, island of emotions, is a place like no other. Because of its insularity, it kept its traditions, its habits and customs, its fauna and flora with a high endemic character. Madagascar has become very attractive for the amateur in search of new discoveries and emotions through hiking and trekking. 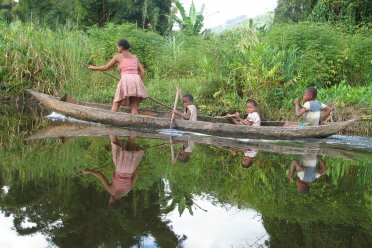 Being a professional Malagasy guide since 1993, I have organized and realized a heck of a lot of trips through Madagascar ; also I can make the following proposal to you. There’s probably no better way to discover the real soul of this magnificent island than to penetrate deep inland in order to feel, touch, smell nature, to be fully submerged in Madagascar’s exuberant natural world. Of course there’ll be times 4WD vehicles and bivouacking will be necessary. A trip to Madagascar provides an authentic nature experience for anyone seeking to experience it in a thoughtful and responsible way. Shall we see each other soon ? Welcoming reception at the airport and foreign exchange operation. Transfer to hotel. A city tour of the Malagasy capital : the Artisan’s Marketplace ( possibility to shop ), the Zoological and Botanical Park ( discover here a synopsis of the local fauna and flora, a summary of the indigenous traditions and customs, a foretaste of what will lay ahead ), visit of the Upper and Lower Town of the capital as well as some interesting monuments. Your purchases can be safely stored at the hotel until departure (D17). Transfer to airport, flight to Morondava. Afternoon tour of the town and its markets, enjoy the spectacular sunset at the world famous Alley of the Baobabs. You’ll be discovering amongst the finest landscape sceneries of Madagascar and experience some true 4x4 road conditions. You’ll be discovering the Baobabs region, the famous Tsingy of Bemaraha, a UNESCO World Heritage site, and a RAMSAR site ( area internationally recognised for its bio-and ecological interest ) ; for nature lovers and birdwatchers, this is it ! You’ll cross some typical Sakalava villages and meet its residents. The journey includes hiking and trekking, pirogue trips on rivers and lakes, crossing mangroves and crocodile regions ( no fear of any danger, we’re not traversing a movie set ), walking through lemur inhabited forests, and of course a trek through the Tsingy. For 3 nights we’ll be bivouacking in tents ( your OWN tent, see below for things to bring along with you ) ; the other 4 nights we stay at a hotel. A long trip to reach the interior highlands. Discover the region known as the Malagasy Midwest, a kind of ‘No Man’s Land’; stops for pictures of Sakalava villages, volcanic massifs, etc. Visit workshops and stores of miniatures ( rickshaws, bicycles, trucks, … ), of embroideries, of precious and semi-precious stones. Discover the Central Highlands, the distinctive red lateritic houses, the numerous ricefields. Morning transfer to the airport, flight to Maroantsetra. Afternoon free, stroll through this quiet town with its market rich in exotic fruits. With small power-driven boats we’ll be discovering a humid and dense primary forest environment, with some huge trees ! Please do not forget adequate rain gear, boots, mosquito repellent, swimming gear, plastic covers to protect your bags, as rains are frequent in this region. Plastic shoes may be handy for crossing shallow streams, and of course most useful : toilet paper. Hiking and trekking through rivers and streams, waterfalls, forests with lemurs, birds, frogs, lizards. From time to time we’ll follow quasi-deserted beaches, your opportunity for a refreshing swim. We’ll spent 3 nights bivouacking in tents ( yours! ) ; the river with its crystal clear water will be your washbasin, and nature will provide the ‘bathroom’. With the journey in the West, we’ll spend a total of 6 nights bivouacking in tents. Return to Maroantsetra by boat, transfer to the airport, and flight to Tana. Transfer to hotel; recover your purchases, farewell dinner. Transfer to the airport for flight back to Paris. You’ll settle all bills locally as we progress through the journey, i.e. in Euros and local currencies. Your own tent, pegs, mattress, sleeping bags ; anti-mosquito spray and cream, pocket torch and spare batteries, head torch if possible, swimsuits, light clothes, but also some warm clothes for the highlands, cameras, small padlocks for your luggage ; your personal medicines such as general antibiotics, anti-diarrhoea, antiseptics, e,g, Betadine, compresses and cotton, ointment for sprains, lip cream or gel ; protect yourself against malaria, e.g. follow a treatment. Sun cream ; walking shoes or closed sports shoes, binoculars if necessary, old clothes ( children’s and adults’ ) to give here and there during the trip ( also biros, colour pencils, old dolls, teddy-bears, small balloons, etc. ) ; Swiss knife, k-way or windcheater, hat or cap, etc. AND cash money = Euros. Created in 1997, Masoala National Park is the largest protected forest in Madagascar. Conservationists and scientists praise the park as the last stronghold and refuge for many species facing increasing threats from slash-and-burn farming and logging practices. The park contains significant portions of lowland and coastal rainforest from sea level to 1200 m, covering about 230 000 ha. It is located in the northeast region of Madagascar, bordering the Bay of Antongil and the Indian Ocean. There are hiking trails that skirt the entire peninsula, stretching from Maroantsetra to Mahavelona and all the way down to Cap Masoala via Tampolo Marine Park. From here, it continues along the coast past Ifaho Marine Park, then upwards towards Cap East and further along to the town of Antalaha. The main trails for visitors are at Tampolo / Ambodiforaha, Cap East and a multi-day hike is possible across the peninsula from Maroantsetra to Cap East ( 5-8 days ). You need porters and cook for this big trekking. Porters, cook and guide are available in Maroantsetra.